TTR/SOSA SITE IN REALITY? IT WAS THE GRAY RANCH, CONSTRUCTED AFTER 1889. The article below is from my third book, San Pedro River Water Wars in the Post Drew's Station Era, the first publication of any kind to conclusively prove that this was the Gray ranch, and not Drew's Station. 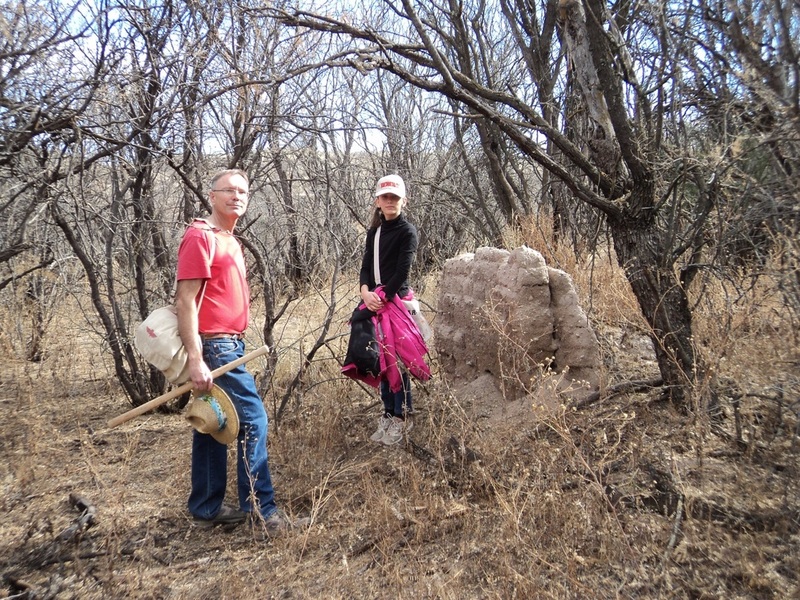 John and Aubrey Rose stand at the adobe ruins of the Gray Ranch. Photo by Stephanie Rose. How the discovery of an unknown map and a court case lost to history proved what the above historical site really was. At the time of the suit in 1889 Wild was living “on a portion of the place purchased by Mr. Cable” noting that this was not where he stayed when he first arrived in late 1881; he purchased the land from Cable “...It must have been in the fore part of January 1882…I didn’t go there until about March 1883...He [Cable] claimed a quarter section of land, a hundred and sixty acres…I have possession of the whole one hundred and sixty acres of land.” Wild was partners with S.B. Curtis and a man named Hubbard. Curtis bought out Hubbard and then moved north as documented on the Rockfellow map. Just as Cable had done before, Wild rented the place to a Chinaman until he himself moved to the site. It may have been the same Chinaman that rented from Cable. Wild was asked a routine question which over a century later, provides a real insight to the site north of the real Drew’s Station site that has been incorrectly promoted by some as Drew’s Station. Q. “What right did you say you purchased in that ditch?” Wild responded saying “I purchased one third of one forth in the ditch.” This amounted to one third of Cable’s right. Attorney Goodrich then asked “Well, what other farms were under that ditch [downstream, using it] when you went there?” Wild stated, “Well, that place a[n]d Summers and the Hill place and the Drew place.” He lists no other ranches further north of Drew’s. 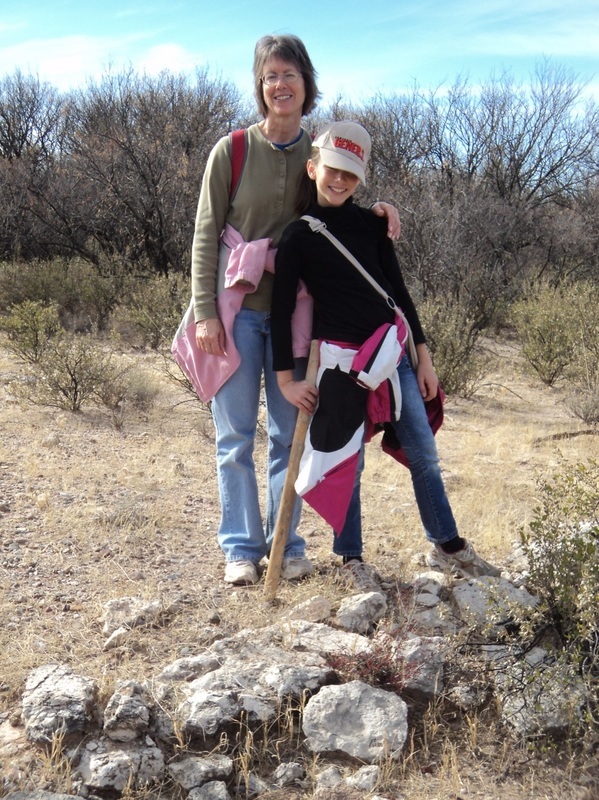 Stephanie and Aubrey Rose at the Hill Ranch foundation. Photo by John D. Rose. 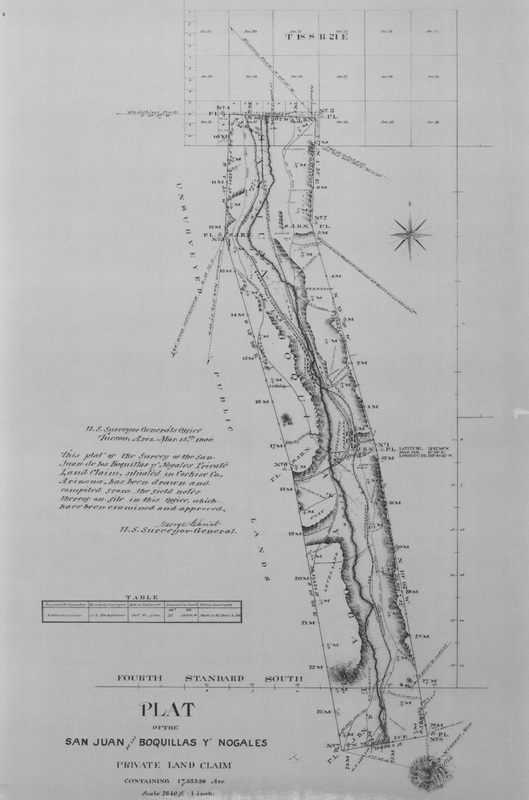 This USGS map shows Quiburi Mission at the location of Santa Cruz de Terrenate, aka, the San Pedro Ruins. As Wm. 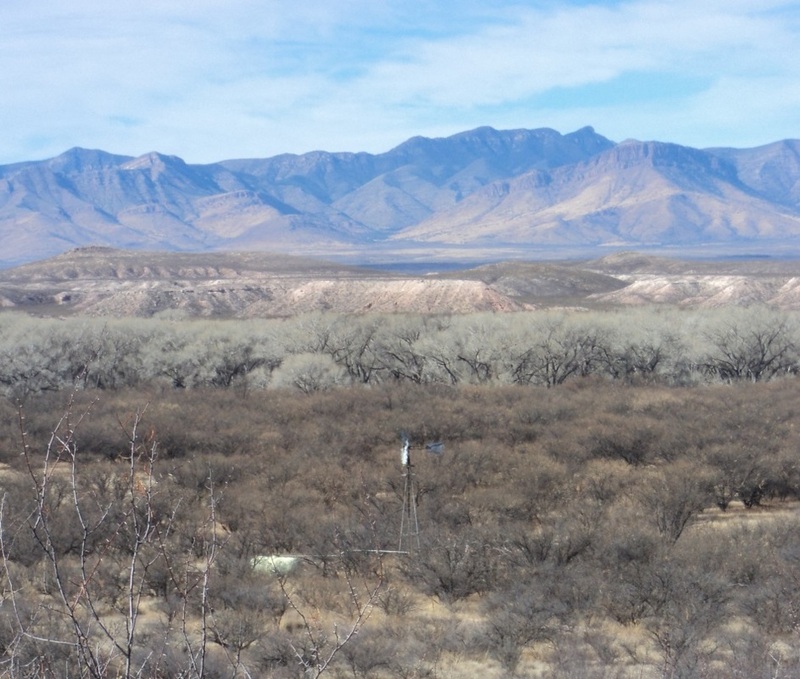 Drew noted, he located his home “about three miles North of the old San Pedro ruins…” Traveling the contours of the San Pedro River, this 2.8 distance is almost exactly three miles just as Drew estimated. “Presidio de Terrenate” has been added to the map for easy reference. The correct location of Drew’s Station is settled. At the north side of Contention, the distance from the Sunset Mill to the robbery site is exactly one mile, just as Bob Paul described. This map appears on page 13 of On the Road to Tombstone: Drew’s Station, Contention City and Fairbank by John D. Rose. 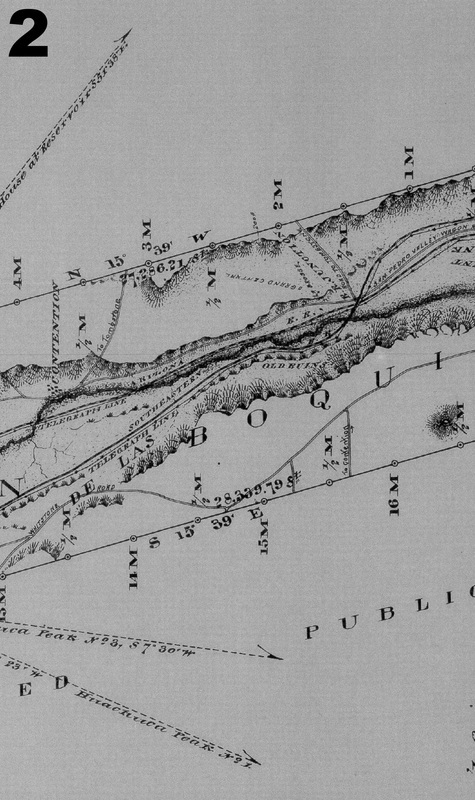 The map pictured above clearly proves that the distance from the north side of Contention (the Sunset/Head Centre Mill) to Philpot’s wash is approximately one mile (according to Bob Paul); Drew’s Station was reported to be another 200 yards beyond this wash. A ground survey today shows that the ruins of Drew’s Station are 533 yards to the northwest. According to William Drew, his station was located approximately three miles north of the ruins at Terrenate as one follows the road (2.8 miles as the crow flies). (See On the Road to Tombstone: Drew’s Station, Contention City And Fairbank, Pages 7-14 and 306-313) The testimony of William Drew (Drew vs. Mason case) and Bob Paul (his telegraph dispatch to Tombstone the night of the attempted Philpot stage robbery) should leave no doubt in the minds of the discerning reader where Drew’s was located. The TTR/Sosa site, now also publicly promoted by John Boessenecker, author of When Law Was in the Holster, The Frontier Life of Bob Paul, defies the ultimate primary sources in the matter. But Drew’s testimony could not possibly resolve the origins of the TTR/Sosa site, as it wasn’t constructed during his lifetime, or during the lifetime of Bud Philpot. The site that the TTR/Sosa group claims is Drew’s station is 3.68 miles north of the ruins. The wash where it claims Philpot was murdered is 3.5 miles north of the same ruins, and approximately 1.99 miles from the north side of Contention. Any site or wash too far north or too far south of Paul’s measurement is obviously incorrect. Hill, who was still living on the old Mason ranch at the time of the suit, was asked, “Mr. Curtis lives below [north of] you?” “Yes sir, does now.” “Who lived on that land where he now lives, in 1882, when you went there?” Hill answered, “Nobody.” Hill further stated that Curtis had between 75 and 100 acres under cultivation. Judge Stillwell then asked, “Did he irrigate this land from this ditch [the Union Ditch]?” “Yes, sir, the termination of the Union ditch goes right to his [Elijah Clifford’s] land; it joins right on to my north line…Mr. Curtis had made a distributing ditch from the end of our ditch to his land, and when there is any waste water it runs in that ditch.” Hill was asked, “How many miles is it from where that distributing ditch commences to the Curtis place?” Hill wasn’t exactly sure, but estimated about two miles. “Is there any cultivation of fields for that distance of two miles before the ditch reaches the Curtis place?” Col. Herring is asking this question as it applies in real time (1889). “No,” Hill replied. This is significant because we do know that on the Drew’s place, occupied by Elijah Clifford in 1889, there were “I should think from 20 to 25 acres…” under cultivation. William and Eddie Drew had said that they were cultivating their land from the spring of 1879, and did so until Mrs. Drew left her land, more than one year after the stage robbery. And before Clifford arrived at the Drew ranch, Horne farmed there. So there was continual cultivation at the Drew ranch at least up until the time of the lawsuit. 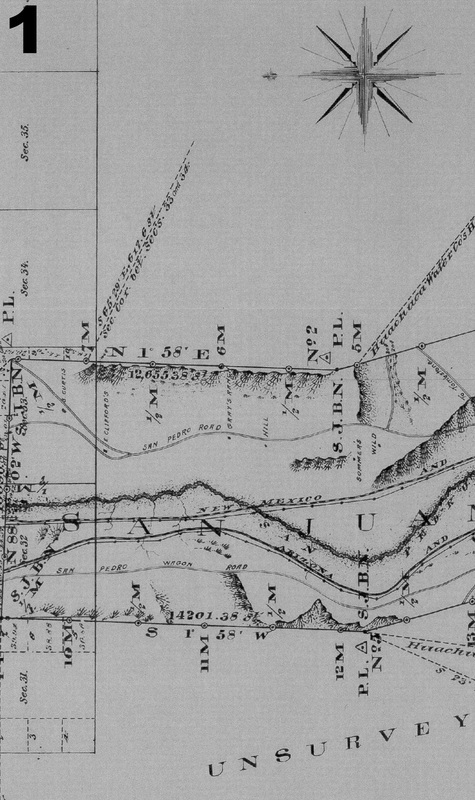 Hill added that Curtis cut his distribution ditch from the termination point in the fall of 1883, and had only grown crops on the Cable ranch prior to that time. So in 1889 there was no further cultivation north of Drew’s until Curtis’ place. So Drew’s Station could not have been located north at the TTR/ Sosa site. In 1889, Hill had two sons living and farming on his land (the Mason ranch). “I have got two [sons]. 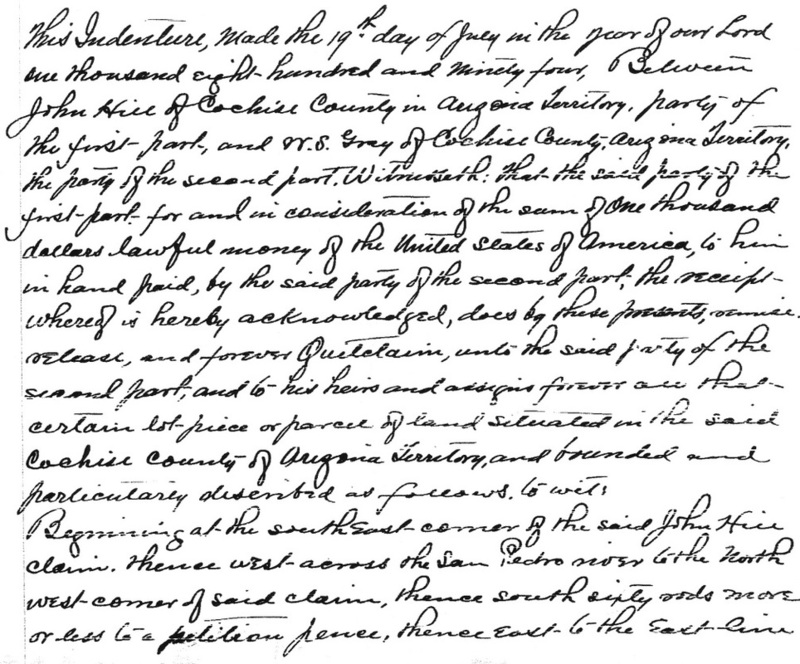 One married son---One left and bought the other out.” It appears that both of his sons moved to a more northern location, even further than the Hill location marked on the Rockfellow map, because in 1894 John Hill sold his northernmost site, occupied at that time by his sons, John Hill, Jr. and F.M. Hill, to W.S. (William Sherman) Gray. Gray appears north of Hill on Rockfellow’s map. John Hill Jr. had decided to move to the Thatcher area, which may have prompted this sale. This key deed proves that John Hill, in 1894, was the earliest owner of record of this property. Given that Hill had not even moved to this part of the country until January of 1882, it is clearly impossible that this site existed on March 15th, 1881, when Bud Philpot was murdered in the wash south of the real Drew’s Station, well south of what would later become the Hill Ranch, with another of Hill’s properties becoming the Gray Ranch in 1894. 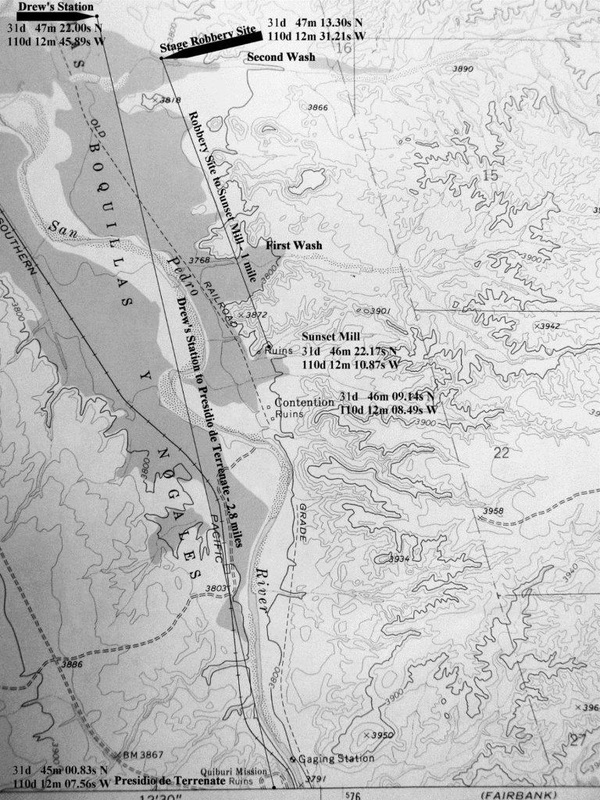 “Beginning at the southeast corner of the said John Hill claim. Thence west across the San Pedro river to the North west corner of said claim, thence south sixty rods more or less to a petition fence, thence east to the east line to said claim, thence north to beginning, said piece of land being now occupied by my two sons J and F.M. Hill. Together with all and singular the tenements, hereditaments and appurtenances thereunto belonging, or in anywise appertaining, and the revision and revisions, remainder and remainders, rents, issues and profits thereof. To have and to hold, all and singular the said premises, second part, and to his heirs and assigns forever. In witness whereof, the said party of the first part has herein set his hand and seal the day and year first above written, John Hill, Signed Sealed and Delivered in the Presence of John Hill Jr. Territory of Arizona County of Graham.” This deed wasn’t recorded in Cochise County until September 5th, 1895, and at the request of W.C. Stachel. By that time, John Hill Jr. had been living in Graham County, and this is why the filing above refers to him as in that county. 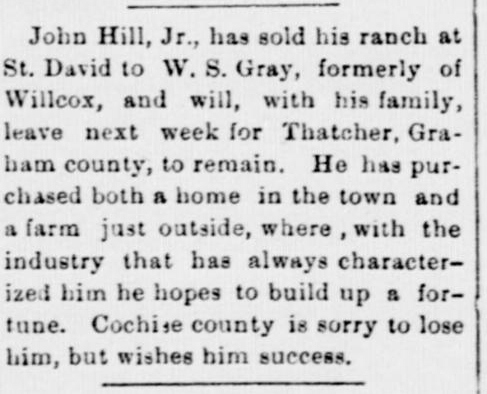 On August 19th, 1894, the Tombstone Epitaph misinforms its readers stating that “John Hill, Jr., has sold his ranch at St. David to W.S. Gray…” It was actually the property of his father, John Hill Sr., who sold to W.S. 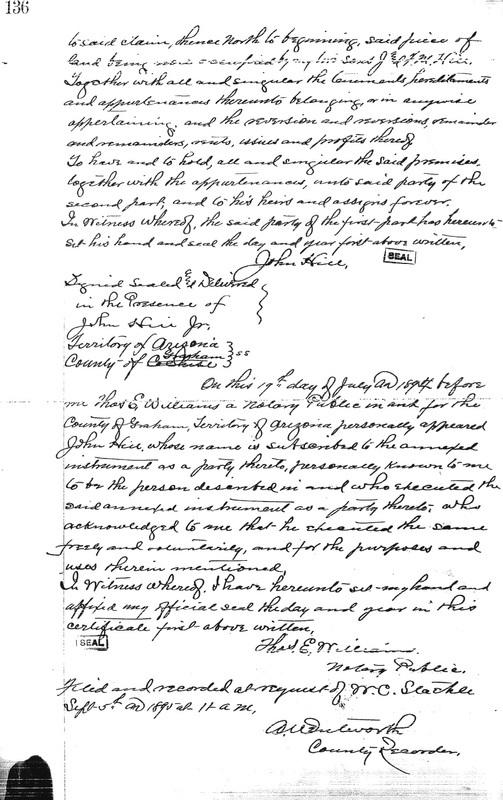 Gray in the deed noted on the prior page. Five years later when John Rockfellow made his map of the area he referred to this property as the Gray Ranch, but it is clear that given John Hill Sr. had allowed his sons to occupy the site before selling to Gray, that Hill is the first owner of record of this location. 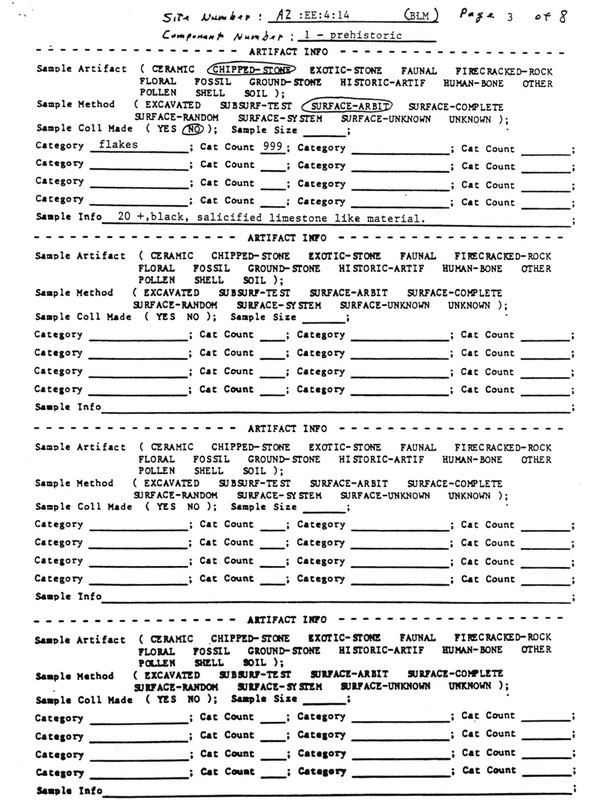 Although some of the following deeds have been transcribed and or cited in the pages above, I am publishing them in original form so that the reader can view them for themselves. The final page of the Hill to Gray deed. Book 12 of Deeds, page 136. Courtesy of Christine Rhodes, Cochise County Recorder. Above is the entire Rockfellow map. On the five following pages, the map has been divided for better viewing. From the collections of John D. Rose. There remain two sets of foundations on Hill’s northern properties. It is the northern foundation which Nancy Sosa identifies as Drew’s station. This foundation is located on the southern area of Gray’s. This means that this foundation, prior to John Hill’s 1894 sale to W.S. Gray, was without question, on his northernmost site. 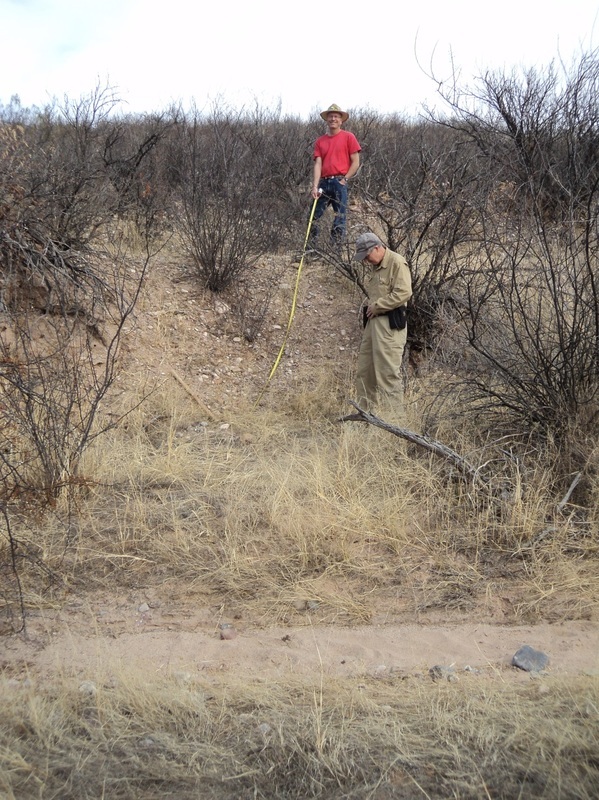 The wash which Sosa and author John Boessenecker identify as the robbery site of the Philpot stage is in some areas perhaps five feet wide, and quite steep on its northern side. In fact, Sosa’s proposed stage road leads right up the side of a hill. That hill is cut with a graded road, having the appearance of being mechanically worked, most likely constructed in the 20th century, as it does not coincide with any roadways published on the Drew, Solon Allis, and Rockfellow maps. John Rose and Richard Bauer illustrate the very steep climb that Mrs. Sosa and John Boessenecker believe the Kinnear stage traversed at the point of Philpot’s murder. Mrs. Sosa identifies the area where John Rose stands as the road that the runaway team raced down after being frightened by gunfire. This would require the runaway team to make a near perfect ninety degree turn without crashing the stage at high speed. Further, this roadway does not head to Benson as it must to be confirmed by the primary sources. Photo by Aubrey Rose. The same photo from the previous page, but annotated with the wagon route that the Kinnear stage must have traveled if Nancy Sosa and Mr. Boessenecker were correct. Bob Paul noted that he did not gain control of the runaway team for one mile after the Philpot shooting took place in the wash, making this site and theory impossible. Computer graphics by Kevin Pyles. This is why it is surprising that, years later, this same site was publicized on the internet as the discovery of Mrs. Nancy Lewis Sosa, who did not acknowledge Mr. Herron, and who also misidentified it as Drew’s Station, now commonly known as the TTR/Sosa site. (Ironically, prior to Sosa’s discovery of the Herron site, the TTR group had scheduled field trips to the correct Drew’s Station, south of the Gray ranch.) Mr. Herron stated to me that he used the notes of Solon Allis to determine the Drew site. 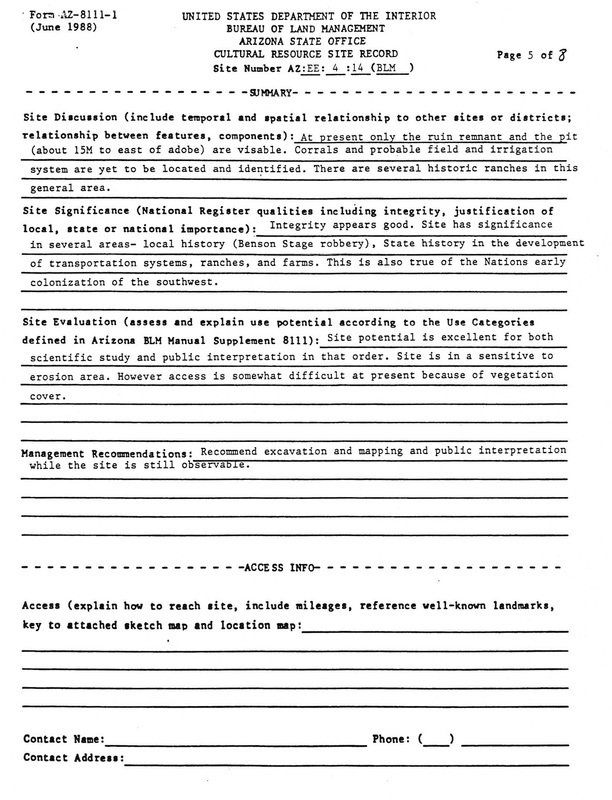 Allis was hired in 1881 to survey the San Juan de Boquillas Y Nogales Land Grant for its new owners, James Howard and his wife Janet who were partners with George Hearst. 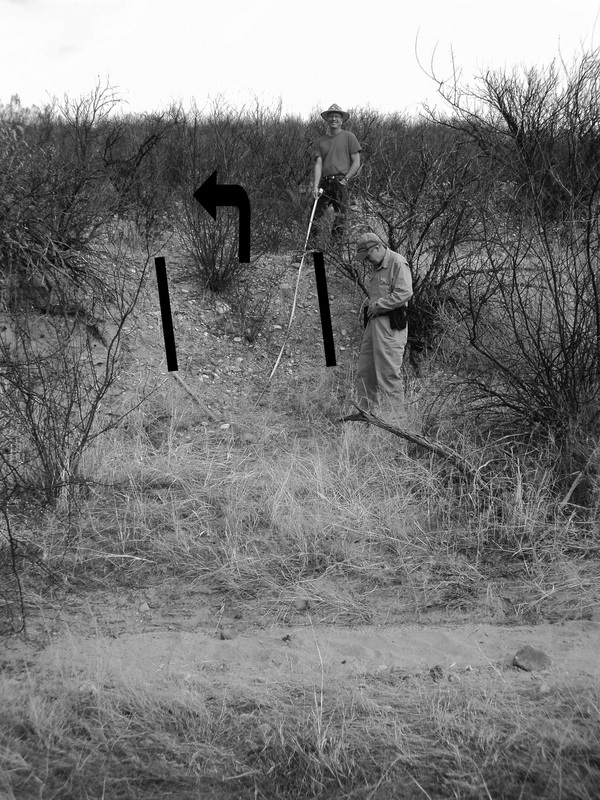 Nancy Sosa site supporter John Boessenecker stated that “The correct location of Drew’s Station was ascertained by Tombstone historian Nancy Sosa in 2010. She consulted railroad maps and assessor’s records and was kind enough to lead the author and other historians on a tour of the site. Today, nothing is left but part of the slate foundation of the stage station and one adobe corner of Drew’s house, located two hundred feet north of the station.” It is unfortunate that Mr. Boessenecker was not aware of the original discoverer of the Gray site, John Herron, as this information did not surface in his research before he validated Mrs. Sosa’s claims of discovery. In defense of Mr. Boessenecker, his book was already at the University of Oklahoma’s Press and in process of being published, when I published for the first time ever William Drew’s testimony and mileage in On the Road to Tombstone: Drew’s Station, Contention City and Fairbank. Also of note is that Nancy Sosa has publicly stated that she also has a copy of William Drew’s testimony, but has yet to acknowledge that this alone disqualifies hers and Herron’s site. But Mr. Boessenecker has yet again reiterated his support of Mrs. Sosa and her Drew’s Station site on the internet even after William Drew’s testimony was published for the first time in August of 2012. 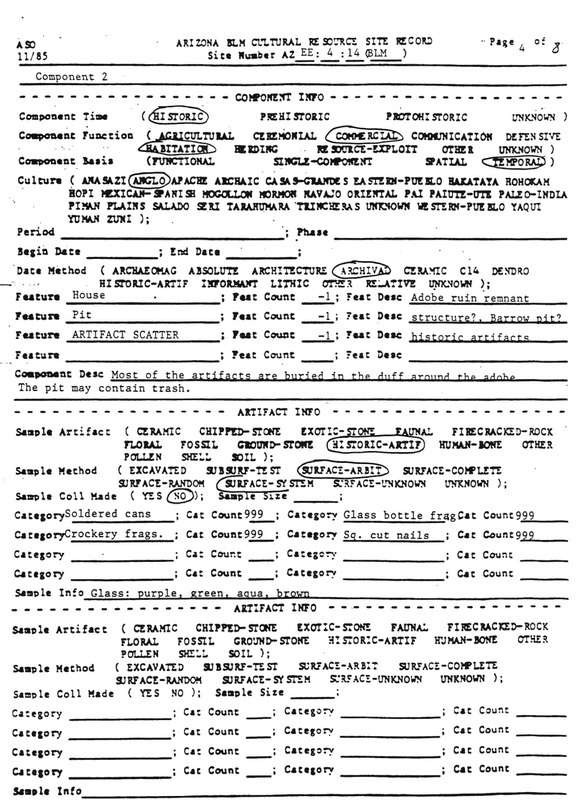 The following pages are the 1990 public recording of John Herron’s discovery. Though he did not locate Drew’s Station, he made a new discovery, now correctly identified as the Gray Ranch. William Drew knew where he built his home and where he lived. Anyone today wishing to dispute the location of Drew’s Station faces a unique challenge. Those who choose to refute Drew’s sworn testimony may need to ask themselves what possible proof would ever convince them? Further, if the principal primary source on this subject, William Drew, holds no sway to some researchers in their analysis and deliberations, why pursue such knowledge in the first place if it appears to mean little when it is finally revealed for the first time after 130 years? 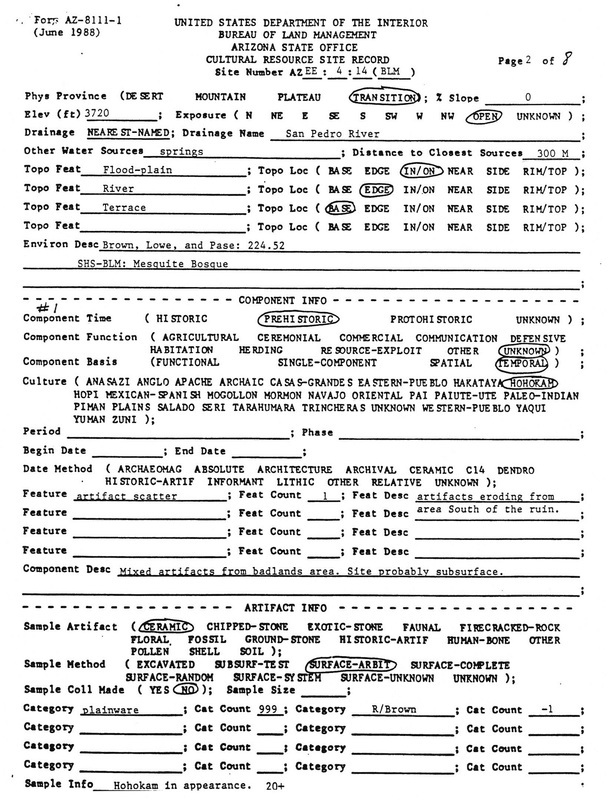 Although Mr. Boessenecker refers to Nancy Sosa’s research materials as proof of her claims, he fails to cite what specifically in those materials convinced him of her case even in light of William Drew’s definitive testimony. If Mrs. Sosa is indeed correct, as Mr. Boessenecker and Mr. Tefertiller both state, then William Drew, founder of Drew’s Station, is wrong. In all other areas of their books, Mr. Boessenecker and Mr. Tefertiller have fully complied with and in many areas far exceeded the publishing standard to provide their sources to their readership. Serious authors such as Boesssenecker and Tefertiller are eager to do so, as this gives their research the credibility to which it is entitled. Yet both authors have bypassed this practice in endorsing Nancy Sosa. It should be noted that Nancy Sosa has promised her readers on the internet a publishing of sources for over two years, and as of this writing, (February 2013) still has not done so. She further states that if others wish to see her sources they can come visit her or attend a lecture. Her credo, “History is best preserved when it is studied, understood & shared with everyone” does not seem to apply in this case. “Everyone” may not be able or choose to go see her or attend a lecture. Why not publish the materials and offer a detailed analysis as to why she believes they prove her point and see if her assertions stand up to the historical scrutiny of all in the field? This issue aside, Mr. Boessenecker is to be commended for his substantial efforts to bring the remarkable career of Bob Paul to life. John Rose stands at the exact location that John Boessenecker stood on page 163 of his book When Law Was in the Holster The Frontier Life of Bob Paul. William Drew testified that he lived about three miles north of the “old ruins,” aka, Terranate. This location is 3.5 miles north of Terranate, disqualifying it as the attempted robbery site near Drew’s Station. The GPS coordinates of this location are N 31degrees 47’ 58.8” W 110 degrees 12’ 26.7”. It is an enduring irony that a 19th Century visitor to the San Pedro Valley, with well-versed technical skills, could open the door to a myth that is still being perpetuated over 130 years later. George Hearst had acted in concert with James Howard, who gained control of the Boquillas Grant in the U.S. Courts. 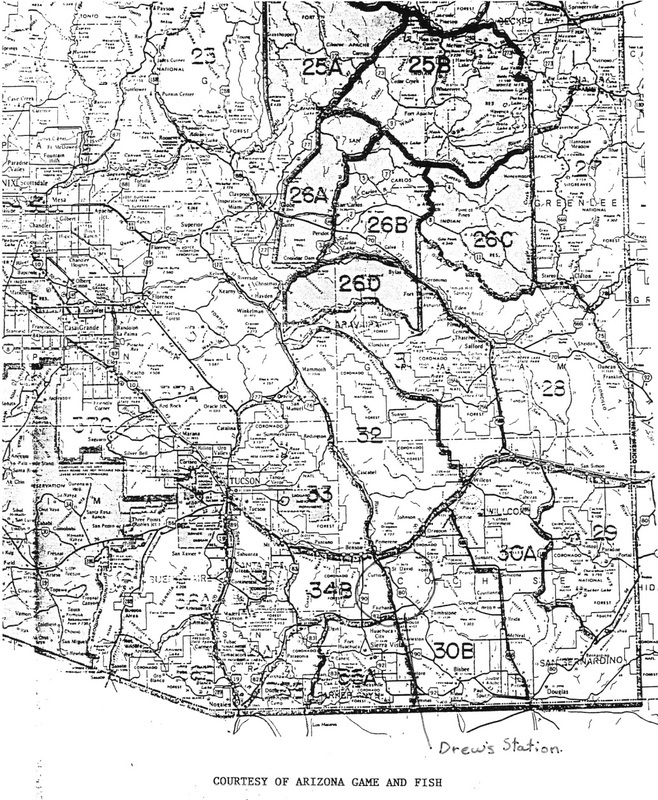 He then brought Hearst into the ownership, and his wife Janet Howard would soon hire Tucson surveyor Solon Allis, U. S. Deputy Mineral Surveyor and Civil Engineer from Tucson, to survey this substantial piece of land, over 17,000 acres. While surveying the boundaries of the grant, he also made mention on the resulting map of key points such as Contention City, the Contention and Grand Central mills, and the old ruins at Santa Cruz (de Terrenate) among others, and the widths of the river at various points. In Allis’ notes, he also highlights other landmarks along his line of measure: adobe house (numerous references to these), new hotel, high gulch, old chimney, etc. 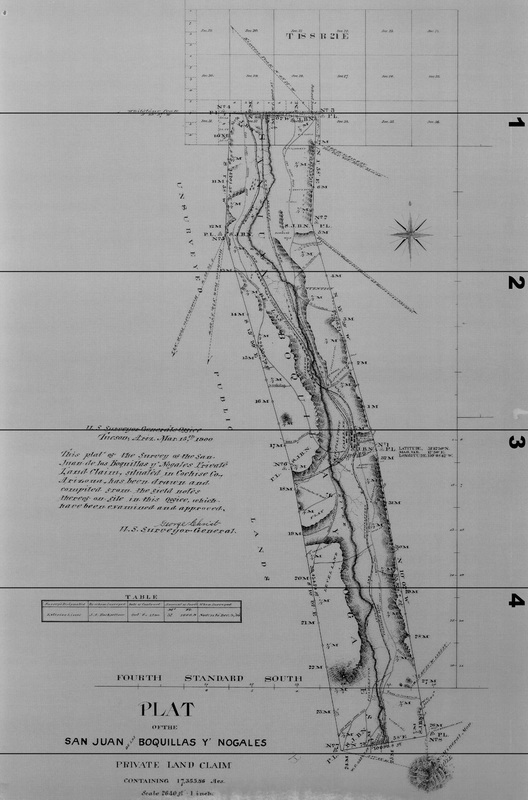 Solon Allis began his survey of the Boquillas land grant on February 23, 1881, at the confluence of the Babacomari and San Pedro Rivers and walked south, apparently along the center line of the grant. He made specific mention of the Christianson house, south of the Babacomari. After Allis measured the southern border of the grant, he headed north. When he reached the chimney and house just north of the “Post marked S.J.B.N. No. 9,” he identified it as Mason’s, and marked it as such on the map. “Chimney of Mason’s House bears N 56” 28’ E.” The story of Drew’s misplaced ranch begins here, in 1881. Allis continued walking north, but found that the trees and brush became too thick to negotiate, so in order to bypass them, he walked a right angle to the east 1,680 feet, then to the north 977 feet. At this point to his west at 300 feet stood some type of structure which Allis identified as Drew’s House. It was located between a wash to its east, and the steep decline to the river on its west. 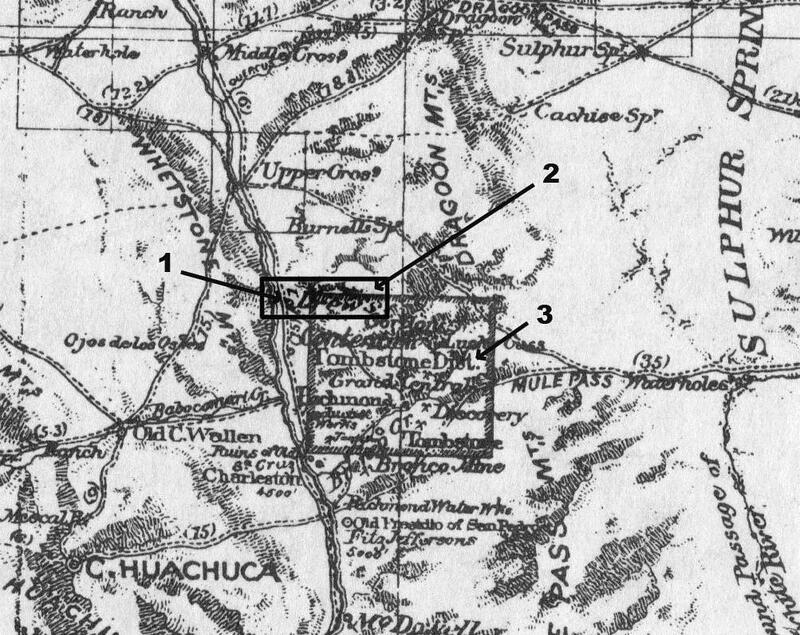 Allis placed Drew’s approximately 500 feet from the San Pedro River, when the Eckoff Riecker map of 1880 clearly shows Drew’s Station located near, but not this close to the San Pedro. William Drew, on his 1879 map, located his building closer to the eastern border of his property, very close to the stage road, which made a great deal of sense for his business. Drew’s seven acres of crop fields fronted the San Pedro River, and he did not build his home/station in the middle of his crop field, as his map illustrates. 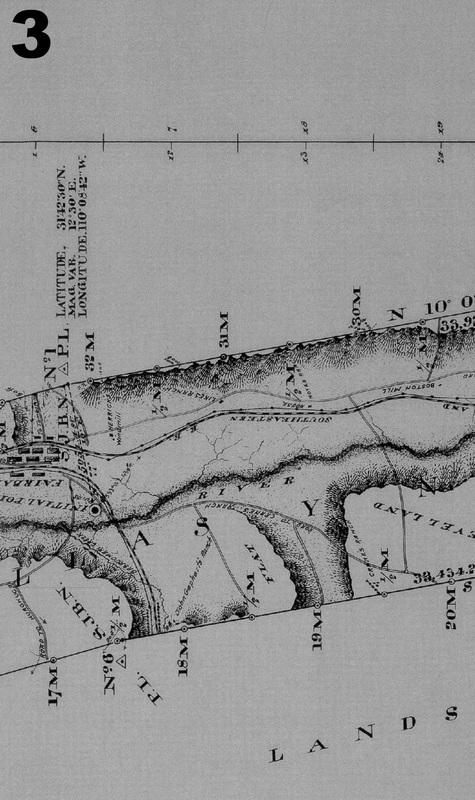 A Cropping from the 1880 Eckoff Reicker map, showing Drew’s. #1 points the location on the map that designates Drew’s, #2 points to the spelling on the map of Drew’s, and #3 points to the letter signifying the Tombstone District. Copy of Eckoff Reicker map from the collections of John D. Rose. Annotated by Kevin Pyles. Now there are two sites in question, instead of just one. In analyzing the work of Allis and the discovery of Mr. Herron, a plausible explanation appears. Solon Allis made detailed measurements of his locations. When checking his locations for mills along the river, he is very accurate. 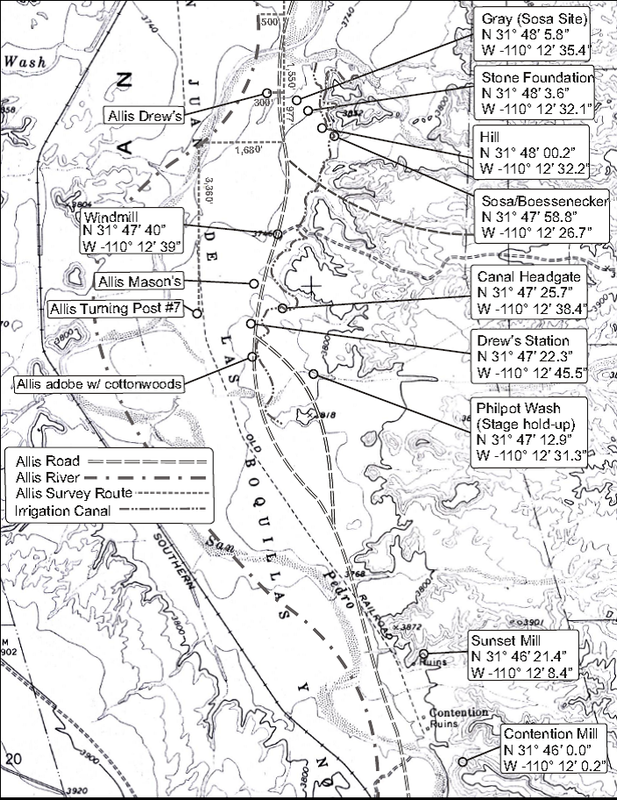 So if Mr. Herron had followed the Allis notes as written, chances are his exploration took him to a site that no longer existed, because it was located close to the San Pedro flood plain. A large amount of erosion has taken place between the 1880’s and today, even between the 1970’s, when this topo map was produced, to the present. The site Allis identified is now lost in an ever widening river bed, as Charleston has eroded over the decades and is being washed away. A short distance from Allis’ Drew’s Station, an old tin can was found, but nothing more. If Herron took the same route as Allis and then exited the river climbing to higher ground, I can confirm the challenge that he faced. 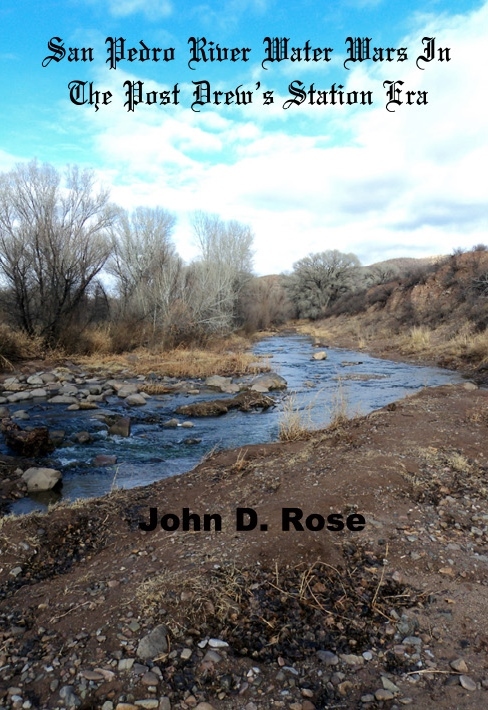 Given there was no site near the river as it was already gone, he may have continued to doggedly pursue searching for a site over rough, overgrown terrain, traveling to a point .16 of a mile east until he discovered the Gray Ranch. Given that this is the closest site to the area that Allis identified it may have appeared reasonable that this must be Drew’s. What John Herron did find was not Drew’s Station, but the Gray Ranch, and he deserves credit for doing so. The Gray Ranch has been proven in this book not to have existed until after the Philpot shooting, and further that it is not Drew’s Station. 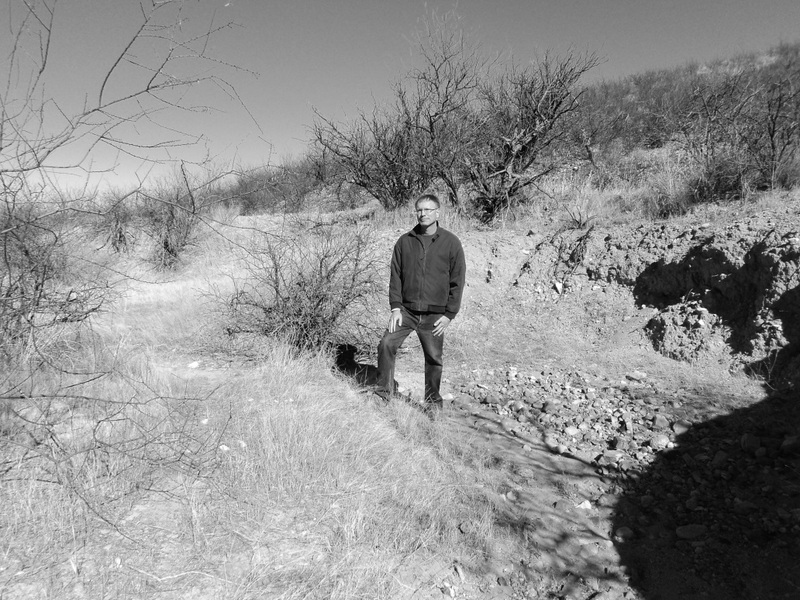 The adobe that he found is but 43 feet south of an area that has been consumed by the widening of the San Pedro River. This lower area may have once been part of W.S. Gray’s crop fields. Both the Gray Ranch and the Allis site called “Drew’s House” are indeed too far north. But if one were to use Allis’ notes exclusively to measure Drew’s location, it would place Drew’s Station closer to the TTR/Sosa site. The following three pages feature the map that I asked Leonard Taylor to create for this book. Leonard’s map traces the footsteps of Solon Allis as he made his survey. Further, I have taken Leonard to this area and we have explored these sites together. Notice Allis’ survey route from turning post #7 and his detours of east and north right angles to avoid the overgrowth. Allis’ “Drew’s House” is at the top of the map. The windmill on the map exists today and is noted for those who wish to navigate the area. So how did Solon Allis conclude that the place he saw was Drew’s? Allis’ assigned task was the proper survey of this substantial piece of land, so it should not be assumed that Allis would be an expert on who lived in which home, or what life in that area was like on a continuing day to day basis for its long-term residents. Allis was a visitor (his office was in Tucson). As such he was misinformed as to which location was the real Drew’s. Keep in mind that by February 1881, when Allis conducted his survey, Contention City had already replaced Drew’s Station as the stage stop in this area. Drew’s was no longer a place where a high percentage of travelers stopped on their way to Tombstone. It is interesting that Allis also made the same error regarding Mason’s ranch. While they are relationally correct, they are both too far north. Drew himself said that his ranch was about three miles north of the old ruins. Allis places Mason at about this location – 2.98 miles as the crow flies, and 3.2 miles as the road curves north of Terrenate. Allis’ error has had an unfortunate effect, as it has caused some to speculate that we may never know where Drew’s Station was. But it is clear that from testimony and foundation stones that we know exactly where it was and still is, regardless of a minor error from a survey conducted over 130 years ago. For Solon Allis to be right, William Drew and Bob Paul would have to be wrong. William Drew testified as to the dimensions of his ranch - we know that he had 160 acres which measured ½ mile in each direction. It is also clear that Robert Mason’s ranch is the same size. Testimony in the Hill vs. Herrick case confirms this. Based on this, the Mason ranch cannot be any further north than 2.5 miles from Terrenate. Drew’s testimony and hand-drawn map were not challenged during the Drew vs. Mason case as to their veracity or accuracy, though the map is not to scale. Though it is of interest to speculate as to how Allis made his errors, both of these home sites found their way into his notes approximately .83 miles north of where they should be. And again, such an error does not indicate that Allis was not competent at his job. His survey did not consist of the duties of a census taker, knocking on doors, verifying the names of those who lived at a given location, etc. However, as we examine the Carlisle Map (see above), Allis may have mistaken the home of a Morgan or another individual who settled on the property north of Drew’s. He located a hard site along the river and incorrectly called it Drew’s. The windmill and tank are viewable from one of the number of approaches that one can take when hiking to Drew’s Station when heading in a southerly direction from it, or to the Hill and Gray Ranch, when heading northerly. The very picturesque scenery of the area is clearly on display in this wintertime photo by John D. Rose. 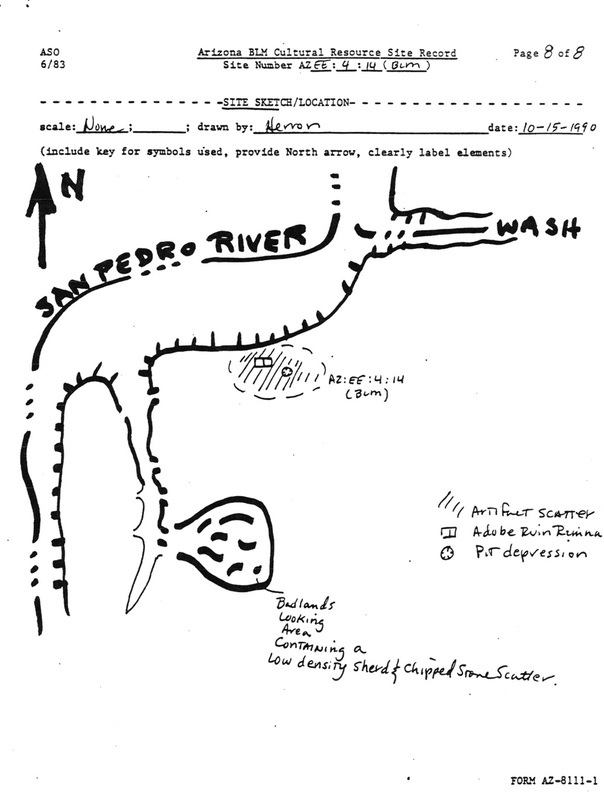 The above information is in part excerpted from San Pedro River Water Wars in the Post Drew’s Station Era, by John D. Rose, published in 2013. This is the first book devoted in great detail to not only the truth about the water flow of the San Pedro River in the 1880’s and well before, but also the revealing truth that the TTR/Sosa site didn’t exist even as late as 1889. For more on this ground breaking historical story and other research breakthroughs, this book is available at as https://www.createspace.com/4216524 as well as Amazon.com.